Home Grills Archive for category "Grill Accessories"
The Saffire stainless steel Damper Top allows precision adjustment of airflow and grill temperature. 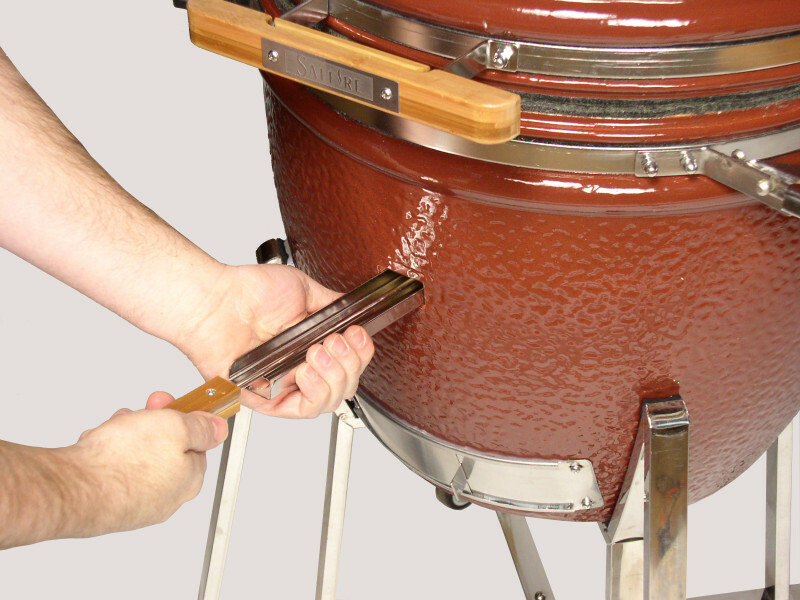 It is simple to operate and corrosion resistant for years of amazing cookouts. 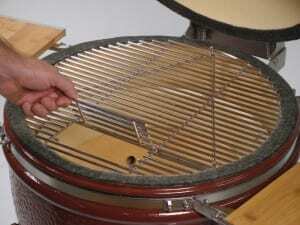 The unique Smokin’ Chip Feeder eliminates the need to open the lid during cooking to add wood chips for smoking. Keeping the lid closed does not change the temperature or interrupt the cooking cycle. 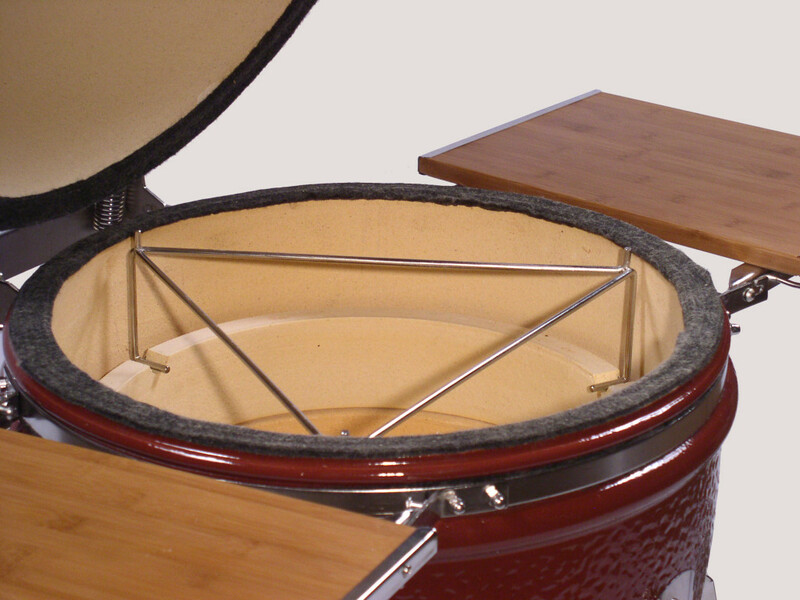 It provides easy access to the fire without removing the cooking grid and keeps wood chips out of the food and hands out of the fire. A “Must Have” for delicious smoked flavor. 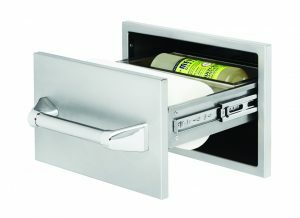 The Secondary Cooking Level is stainless steel and adds 180 square inches to the cooking area. 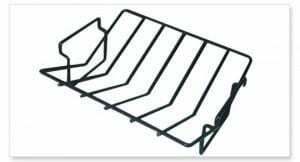 This kamado grill grate increases the total cooking area to 460 square inches, which is equivalent to a large 27” x 17” rectangular grill. This raised grill grate is a terrific way to cook multiple items simultaneously! 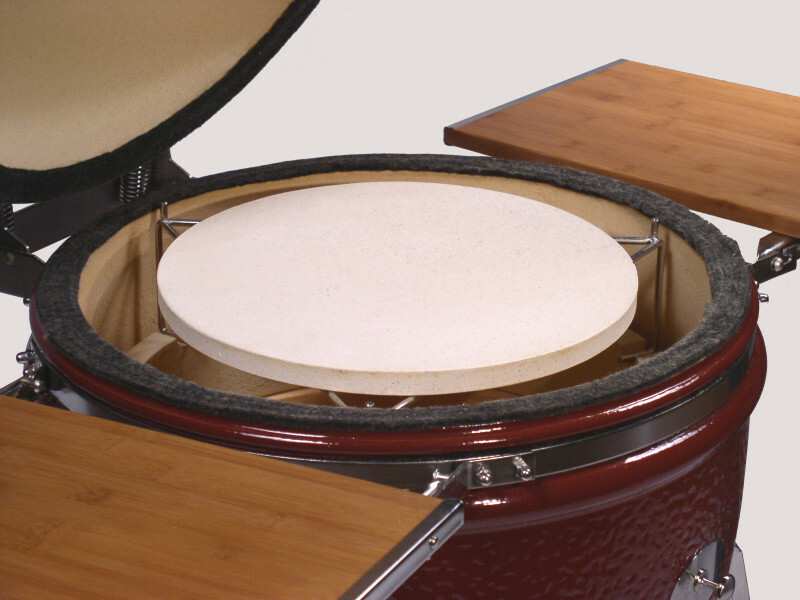 The Saffire Grill makes an excellent wood-fired pizza oven with the addition of the 14″ Pizza Stone. It is also good for a variety of baking needs such as bread or cookies. 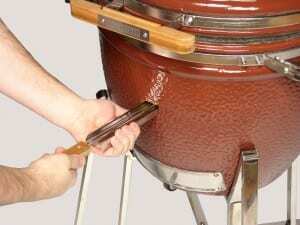 A kamado grill Pizza Stone is a “must have” accessory! Pick up your Pizza Stone at Heat’n Sweep located right outside of Lansing, MI. The Saffire Ceramic Heat Deflector provides indirect heat so larger pieces of meat may be roasted to perfection without burning. 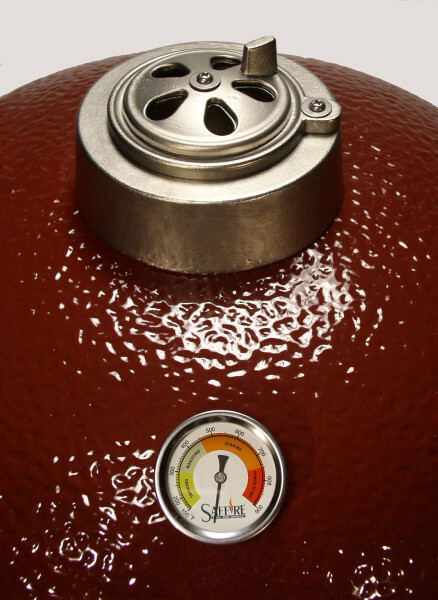 It also turns the Saffire Grill into a highly efficient smoker. The Saffire Stainless Steel Cooking Grid is a durable, easy-care surface, which allows use of any type of spatula, brush or scraper without the risk of chipping or scratching porcelain. The innovative Hinged Access Door in the Cooking Grid provides access to the fire without removing the cooking grid. 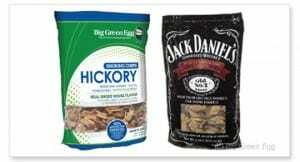 Use for adding or adjusting charcoal and wood chips or chunks. The Saffire Cooking Grid Elevator, a ceramic grill accessory made of stainless steel, elevates the cooking grid or pizza stone to the top edge of the grill. This Saffire grill part allows easier access to food and use of a pizza peel when cooking pizza. The Big Green Egg dual purpose porcelain coated V-Rack can be used upright to hold roasts and poultry or flipped over as a rib rack. 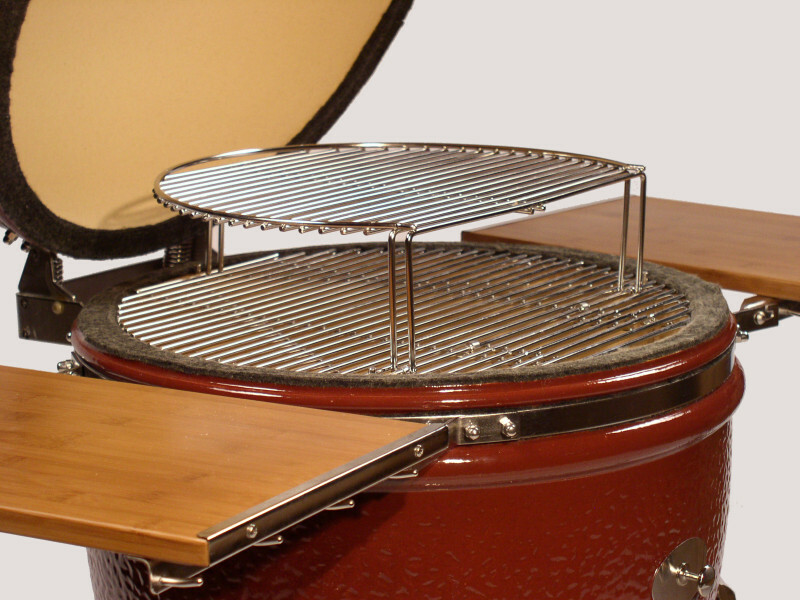 This sturdy rack is perfect for roasting and smoking. 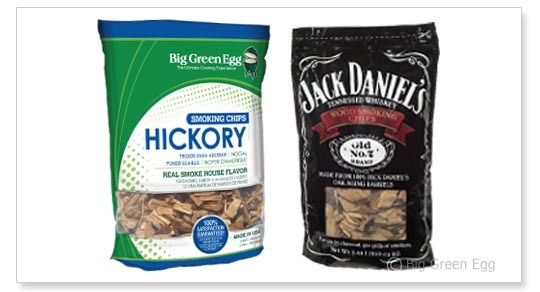 Wood smoking chips and chunks add a variety of delicious flavors to foods cooked over the coals. 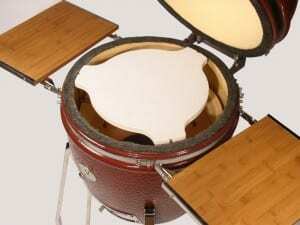 Each type of wood imparts a unique flavor to meats or other foods resulting in an endless variety of new flavor combinations. Flavors include Apple, Cherry, Hickory, Jack Daniel’s, Mesquite and Pecan. Try a couple types of chips today!